Prova.fm wants to change the face of crowdsourced design. 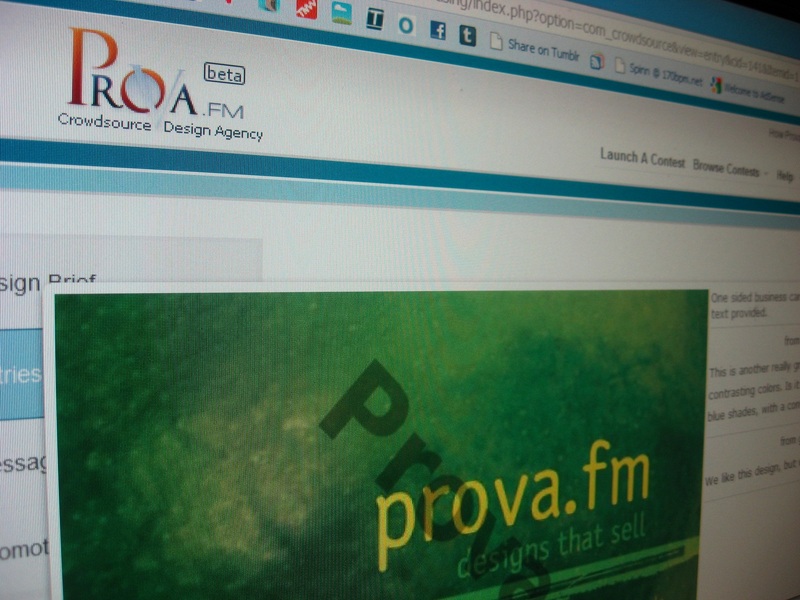 When I first heard of Prova, the first thing that popped into my head was “OK, it’s another design group”. At first glance, I didn’t notice anything different about what the site was doing. In fact, it seemed to be a replica of another well known crowdsourced design site. Finally, it made sense. While other sites focus solely on design, or solely on advertising placement, Prova has the guts to attempt to do both, plus more. That said, let’s take a deeper look at Prova and how what they’re doing makes them different. On the outsite, Prova offers a pretty simple service, but does it very well. You, as a business owner, submit a project to Prova. Then, Prova’s crowdsourced team will go to work to provide you 30+ different designs within your budget and description. If you find one you like, you buy it. This is the part where Prova looks a lot like other people doing the same thing. It’s the extra features, however, that really set Prova apart. A design, for instance, can get feedback from its target market, then be voted up or down for popularity. When you add this sort of social strategy to a crowdsourced product, it simply makes things more effective. As David says, “understanding what your audience likes is a huge part of effective advertising”. The entire focus of Prova is to help small business owners get designs that attract more customers. This attention to a major detail is what puts Prova’s head above the shoulders of the rest. Of course, that also means going far beyond a pretty picture, and Prova understands that. Proper headlines, calls to action and illustrative elements all have to combine to give the right message. That’s where the social element of Prova’s ideas really shine. In short, voting is good. Prova probably isn’t the right choice for everyone, but for emerging businesses, it’s an amazing resource. The same can be said for designers trying to make their mark. It’s certainly worth a look, whether you need a one-shot advertising logo, a business card or even a long-term commitment. Read next: 2.2 comes to Nexus One. Is your phone next?